Oslo City Hall seen from the seaside. 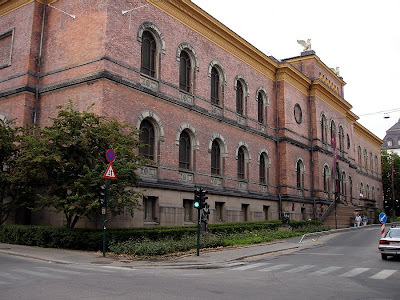 We have shown you this building before and told you a bit of it's history. Tomorrow we'll have a closer look at one of the details on the wall. Yesterday's photo by Mark was from the Vigeland park. This photo is also by Mark, and even though we've showed you this statue before, I think it deserves to be posted again. I like this photo because of the angle and the evening light. 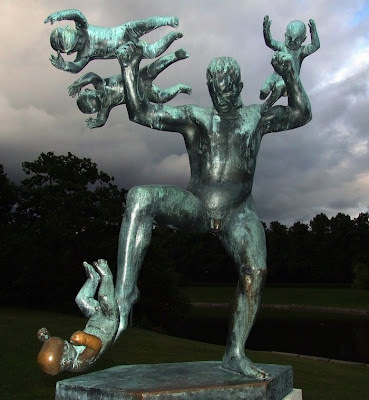 I'm not sure what the story behind this statue is, he may be balancing the babies or throwing them... 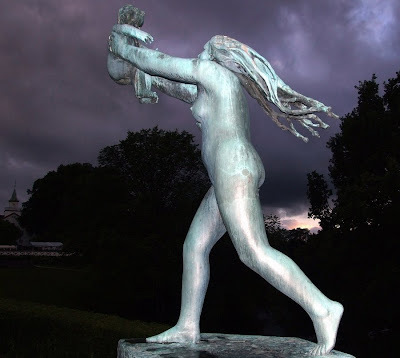 Anyway, it's one of the many statues by Vigeland in the Vigeland Park. We've showed you lots of pictures from this park earlier, just click on the labels and you'll find more. From Oslo last night. My very first picture of lightning. We have had some really fast-changing weather in Oslo lately. From heavy rain to sunshine in just a little while. 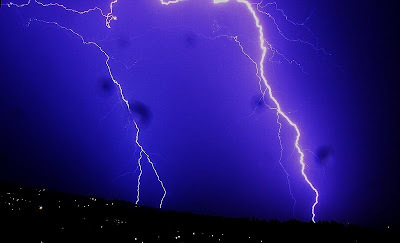 We have had some thunderstorms too, but it's hard to take pictures of it during daytime. 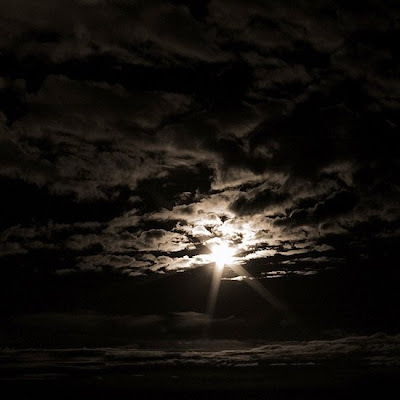 I have been waiting for it to happen during night-time, and finally..! Last night I could hear this really loud bang. 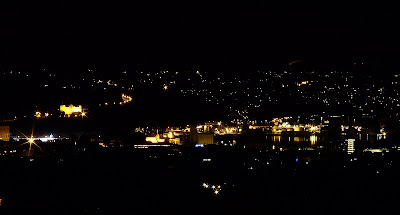 I went out on the balcony and spent the next couple of hours taking pictures of the sky, hoping there would be some lightning at the right time. I did get several photos of lightning, and this is probably the best one. 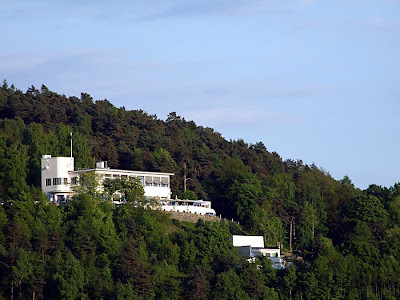 Ekebergrestauranten (the Ekeberg restaurant) has a fantastic view, as you can see on this link. 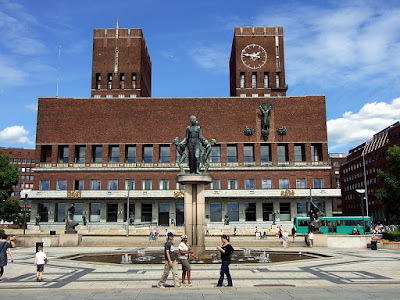 The building was set up in the 1920's and is one of Norway's finest examples of classical functionalism. The restaurant has always been a popular place, but unfortunately had to be closed in 1997 due to decay. After extensive restoration, it was re-opened in 2005. 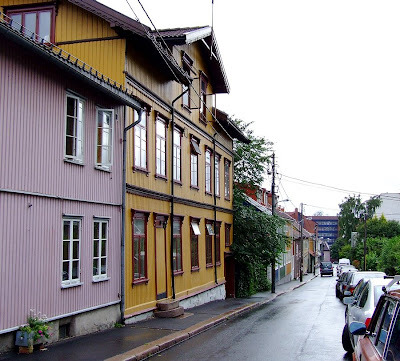 Yesterday's photo was from Rodeløkka in Oslo. This is a photo of one of the back gardens. A lovely place, hidden for most people. The area used to be a typical working class area and early 1900 it was regarded as a slum. For a while it was decided that the whole area would be torn down, but after demonstrations a lot of the houses were kept and renovated. 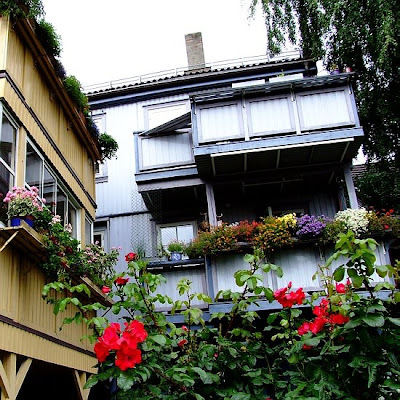 The remaining 137 buildings were declared worthy of preservation in 1988. I was planning to see if I could spot Jupiter on the night sky, but unfortunately, I couldn't see much because of some clouds that were in the way. I did get this view of Oslo, though. This is what the night is like in Oslo right now. 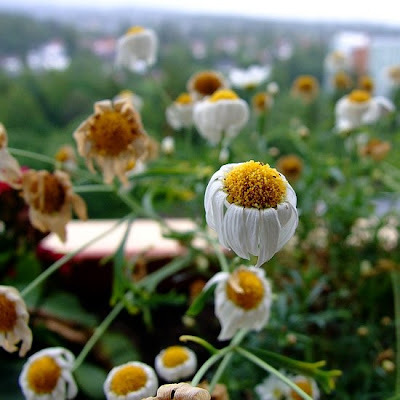 My summer flowers are dying. Does it mean that autumn is approaching - or is it just because I'm a really bad gardener? 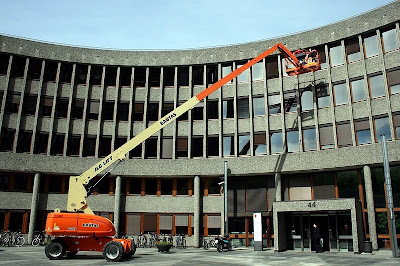 If this person was cleaning the windows when I took the photo, he'll probably still be at it. Poor guy! This building is next to the office of the Prime Minister. 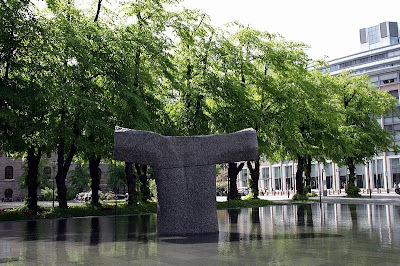 A modern sculpture stands outside the office of the Prime Minister. 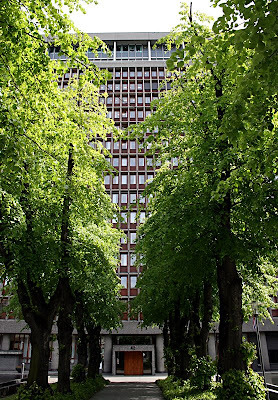 It doesn't look like much, this building, but this is where the Norwegian Prime Minister and the secretariat have their offices. 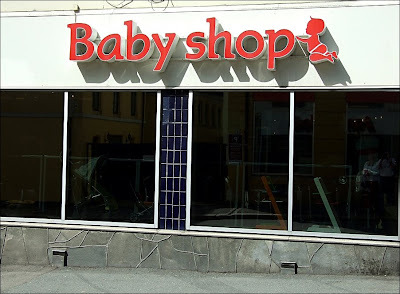 We call it Regjeringsbygningen. This statue is of Kirsten Flagstad, a very famous, Norwegian opera singer. She lived from 1895-1962 and is considered to be one of the greatest Wagnerian (dramatic) sopranos of the 20th century. From 1958-1960, Kirsten Flagstad was the general manager of the Norwegian National Opera. 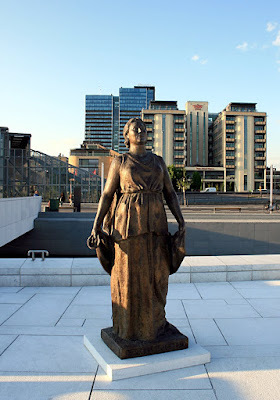 The statue is naturally placed outside of the new opera house. 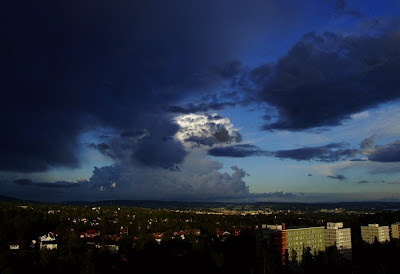 After a long period of really warm weather, Oslo has got some thunder and rain. 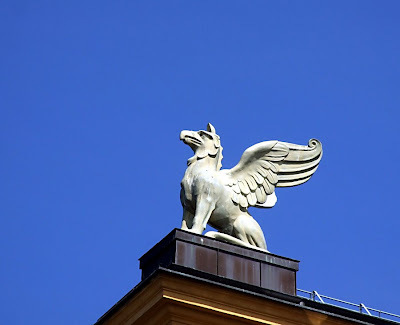 This is one of the four griffins that are 'on guard' on the roof of the National gallery in Oslo. 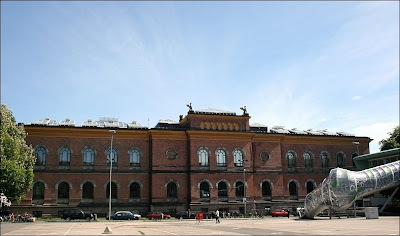 The National Gallery (Nasjonalgalleriet) was built in 1836 and enlarged in 1903–07. This picture is from the other side of the building. You have seen parts of this before. 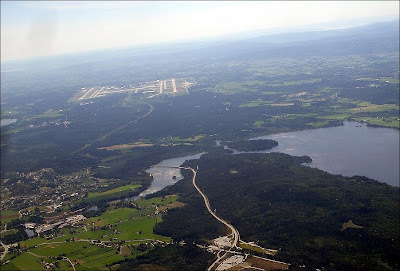 Flying to Gardermoen Airport, Oslo, this is the view the pilot gets as he approaches the runway, in this case it's runway 19L (19 left). Sagmoen lies to the bottom left of the photo and the road you can see is the E6.